You are here: Home / Galaxy Note 4 How-To Guides / How to enable and access Galaxy Note 4 air command? What is Galaxy Note 4 air command? Air command is a unique S Pen feature in Galaxy Note devices since Galaxy Note 3. You can access some features very quickly by hovering the S Pen over the screen. It can dramatically increase your productivity for some tasks. In Galaxy Note 3, as discussed in this air command explained post, there are 5 commands: Action Memo, Scrapbook, Screen Write, S Finder, Pen Window. New! Smart select: Collect content from the screen quickly. You can collect content from webpages or music and videos during playback. New! 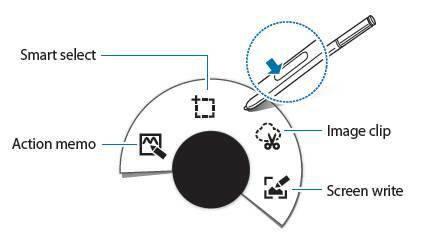 Image clip: Draw around an area of the screen you want to save or share. You can also crop part of an image. Screen write: Capture, edit, and write memos on screenshots, and then share them. This is actually one of the preferred method to take screenshot on Galaxy Note 4 as discussed in this guide. For the usage of these 4 actions in Galaxy Note 4 air command, we will create individual guide. How to access Galaxy Note 4 air command? By default, when you remove the S pen from the S Pen slot, Galaxy Note 4 air command will be shown on the screen. 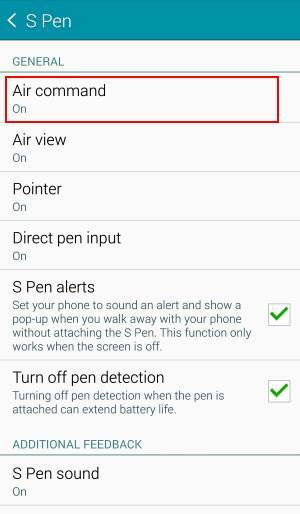 This is due to the default settings in Settings– S Pen –Detachment options as shown below. As you may notice, actually, you can set the S Pen detachment options to action memo or none, instead of the air command. Some owners are not aware that you can access Galaxy Note 4 air command at any time. I noticed some Galaxy Note 3 owners keep removing S Pen just to access air command. Another way to access Galaxy Note 4 air command is hovering the S Pen over any part of the screen and press the S Pen button. So, you can access the air command whenever you want without putting back the S pen. 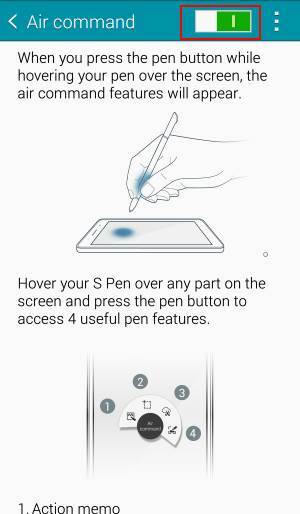 Please note, you need release the S Pen button after pressing it, i.e., NOT holding the S Pen button. How to enable/disable Galaxy Note 4 air command? Sometimes, Galaxy Note 4 air command does not pop out when you take out the S pen or hover the S pen over the screen with S Pen button pressed. You may accidentally disable the air command in your Galaxy Note 4. 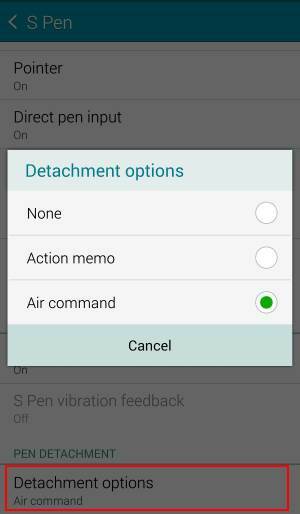 To enable or disable Galaxy Note 4 air command, you can go to Settings–S Pen –Air command as shown below. You may drag the switch to left to disable Galaxy Note 4 air command, right to enable it. Why air command is grayed out? Some accessibility settings are NOT compatible with Galaxy Note 4 air command. When you enabled such accessibility settings, there are the warning message. But most of time, nobody read it. Anyway, if you find out air command in Galaxy Note 4 or Note 5 was grayed out, you can check the accessibility settings. You need to turn off these settings to use air command. Can you access and use Galaxy Note 4 air command now? If you have any problems or questions using or accessing Galaxy Note 4 air command, please post them in the comment box below. If you have any tricks of using or accessing Galaxy Note 4 air command, please also share with the community in the comments. My phone is galaxy note 4 and the air command won’t be on! It’s like however I tried to press the off button to be on, it doesn’t work. Did you disable the air command feature? Did you enable any accessibility options? The air command is not working on my Note 3; when pushing on the pen button the aircommand feature doesn’t pop up; spen is activated, aircommand also. tried the pen on tablet and there it works. can you please assist? If you pull of the S Pen, what happens? Which action? Can you share more details? issue fixed . Many thanks! My galaxy note4 air commands always pop up by itself, how I improve it? When S Pen is in the slot? Thanks a lot my friend , it was really useful. Turning on the hover then going into s pen settings and turning back on air view which disables the hover zoom fixed it. My Spen air command is gray and I can’t change it anymore. Very likely, you turned on some accessibility settings. Check your accessibility settings. Thank you so much for the tip. I followed your instructions and went back to air command and was able to turn it back on. I contacted TMobile and Samsung and both times noone was able to help me. The button on my SPEN doesn’t work. I’ve bought a new pen and checked all settings. What’s not working? When you hover the S Pen over the screen, can you see the cursor? Hi, when i detach S-pen from My Note 4, it is not showing Air command even by pressing the button on S-pen. Earlier it was working but i don’t know what append now. In S-pen Setting when I access the AIR COMMAND, it shows 2 options, “SHORTCUTS and FLOATING ICON” but both are grey & unable to turn on. Please guide. Very likely, you enabled some accessibility settings. Some of them don’t work with air command. can you please guide me how to restore the original setting for S-pen? As mentioned, check Settings – accessibility. Turn off any settings under accessibility, then check again. Hi i have the same problem here. I already check the Accessibility and its already off.. but why i still cant active mt air command? How to make sure that the accesibility already off?? There are many entries in accessibility settings. You need check TalkBack, magnification gestures, hover zoom. Any of them can disable air command. I used to able to share pictures using the air command directly but now I can’t, I have to save it to gallery first then share. What settings have I accidentally disabled? Do you mean share screenshot? After taking screenshot, you can find the options (together with edit and scroll capture) in the bottom of the screenshot. But if you don’t take actions within about 3-5 seconds, screenshot will be saved automatically​. And you will return to wher you were before taking the screenshot. In other words, the screenshot will be shown on screen for only a few seconds. Lanteria, that works. Hover on and off in accessibility vision menu. Did you turn on any accessibility settings? It worked for me great! use every step. After leaving Accessibility go back the S Pen and then Air Command options will work now. That worked like a CHAMP! THANKS! It is really work for me.. thanks bro. Appreciate that. Many thanks it really works! ! Thank you a bunch!!! it really work. be blessed. Hi, after the latest software update, i was facing some problems with frequent reboots on my note 4. It actually went to boot loops. However, it recovered. But after that the air command and spen itself stopped working. i have tried reboot many times with no positive result. finally decided to factory reset, this also went in vain. Did wipe data factory reset from recovery, that also did not help. Finally, my note 4 stays without its pen. Thinking of downloading the firmware from net and flashing it through odin. Comments pls. If it’s a hardware problem, flashing the phone will not help. But it seems you don’t have other options unless the phone is still under warranty. THIS WORKS!!!!! Thanks for the repost! Excellent tip, it works on my note 4! Thanks much! When talking on the phone I want to make notes with screen write but I can’t because screen write us stuck in command mode and I can not select option buttons to get to the person I want to talk with. What is the fix other than re-interested the stylus to turn air command off and loose the notes I wrote. Not sure what exactly you want to do. Screen write allows you to take a screenshot (and you can add annotations). Why do you want to select contacts when using screen write? I uninstalled the air command from the screen by mistake how can i bring it back? I don’t think you can uninstall it. Did you root the phone? When I go to air command menu here floating icon is disable and I do not avle to turn on. Please guide me how do I fix this problem. My S pen is correct but floating icon do not able to on. You probably have to back up the phone and try a factory data reset. I’ve been having thus air command issue for months. Can see pointer etc just no air command popping up. Til just now. After making sure all settings are on you need to go to….device then accessibility then vision and turn switch access off. That’s all I did and now good as ever. I cannot activate the Air command on Samsung Note 4. Air command settings is in grey. When i remove the S pen air command not working. Reboot and clear cache partition. Back up the phone and try a factory data reset. I cannot activate the Air command after the Samsung Note 4 was updated. After you pull out of the s pen, do you see a pen icon on near the right edge of the screen? You can try to reboot the phone or clear cache partition to see whether it helps. I have a Verizon Note 4 and my air command will not work. I tried going to settings, S Pen, and then air command but when I go to air command, it will not let me turn it on. Some owners reported the issue after Marshmallow update. You can visit local service center to get it fixed. You can also back up the phone and try av factory data reset. Since the recent android update I have Lost the air command and when I go to change this it is greyed out. Why is that? Did you try to reset the phone? You should back up the phone before resetting. on my Note 4 , Detachment Options works fine if its for Action Memo but Air Command is not working after a recent update before that Air Command was working fine… is there a way to remove that update ? You cannot remove the system updates. You can only flash the phone with old firmware. You can do this in local Samsung service center. Anyway, did you try to clear cache partition or try a factory days reset? Can you make air command open when detaching pen even when lockscreen is on? I could do this with my Note 2. It depends on lock screen security. the air command is available only when lock screen security is none or swipe. For security reasons, if the screen locked (and it requires pattern, PIN, password or fingerprint..), no apps can be launched except camera and emergency call. Screen write always take a screenshot. Then ask you to edit or write on it. What and where do you want to write? You can always write on the photos or screenshot when editing the photos or screenshot. Yeah and thats the problem I cant edit or write on photos. It just doesnt appear and when i go to my gallery to edit it also doesnt work. Can you edit photos or pictures in Gallery app? Open the picture in the Gallery app. If you cannot see the edit menus on the top, tap the picture once. Tap the menu key (3 dots in top right), you can find the option “Write on image”. You can also write/draw in Studio. Can you use finger to write ? You can also choose studio to edit pictures, or tap edit icon (between share and delete icons). Then you can draw on screen with finger or s pen. Many S Pen features require the stock ROM, as I know. If the ROM is really for your region and model, the S pen should work. You may try to clear cache partition. Anyway, if you need S Pen, you should not try different roms. You can visit local Samsung service center to ask them to flush the correct firmware for you. Hi !! I use galaxy note 4 . SM910G . I have kept air command option on for s pen detachment. Whenever I remove s pen system hangs and restarts. Please help. Did you install any task manager app or antivirus apps? Try to disable them if you installed such apps. Did you try it in safe mode? Then you probably have to visit local Samsung service center, or reset the phone. Please note, if you installed any antivirus apps or task killer apps, you can try to uninstall them. Hi, just updated mine Note 4 Duos to Lollipop version and my s-pen does not work at all. i did a clean install from odin. i dont know if this is due to Lollipop being buggy at the moment for our device. any suggestion? Are you sure the firmware is for your phone model? There are no such problems for note 4 lollipop update, as I know. yes i am sure. although KIES says my previous version which was 4.4.4 was upto date (i assume it is because of the availability of the update according to country). my phone by the way is made in vietnam. also, my phone is rooted using chainfire. Not sure. But it sounds like the ROM is not for your phone. After install the update, did you try to factory reset it again? As your phone is rooted, Samsung service center may consider it is out of warranty and you may have to pay to get it fixed (usually they will flush the correct ROM). there are 2 selections in sammobile for SM-N9100, hongkong and china only. i installed hongkong version. i dont know how it might not be for my phone. yes i did because i came from kitkat to lollipop so i was having trouble with some apps being corrupted. I have been facing few issues with my Note 4 after the recent Lollipop update..
1. The ‘Hi Galaxy’ feature doesn’t seem to work at all.. infact it has disappeared. Even the ‘Ok Google’ is getting worse. 2. I also have trouble with the SPen.. everything else is fine with the S Pen. Its just that I can’t use Air Command. When I detached the pen, the screen shows Air Command+ the options. But the moment I point the pen to activate any action; it freezes for a second and then device restarts by itself. After reading your previous comment replies.. I even tried the SAFE MODE.. but it did not help. Please suggest something.. Or, Is Factory Reset the Only way out? 1. you need re-configure S Voice.Anyway. Google Now is better than S voice (arguable). 2. You can try to clear the cache partition following this guide. If still not work, you have to backup the phone and do a factory reset. If factory reset doesn’t help, you may have to visit local Samsung service center to check the phone. Try it on safe mode. If you still have the problem in safe mode, you probably have to backup your phone and reset it. I have the same problem whenever i use the air command, my phone hangs and after a while it reboots. However it was perfectly useful for couple of months ago. I’ve tried to hard reset and restore factory but still the problem persist. You can test air command in safe mode. Bought this Note 4 for 3 months, everything with the S Pen is ok until recently when I couldn’t use Air Command. When I detached the pen out of the device, the screen shows Air Command (with 4 actions). But i can’t point the pen to activate any action. It is like the device is freezing for a while until the device is restarted itself. Any suggestion? Please help. As replied on previous comment, you can try to test it in safe mode. If you still have the problem in safe mode, you probably have to backup your data and reset the phone or visit the service centre. i can’t use the air command option on the stylus. everytime i do so the system says process system is not responding and then the mobile reboots. what should i do. If you always get this problem, you may try to backup the phone and try a factory data reset. Of course, you can visit local Samsung service center to check the phone. Thanks for pointing out to release the button. I Couldn’t get my air command to Show up because I was pushing it and not letting go. Thank you for the update. Enjoy your magic pen. Thanks you. I was going banana. figuring how to do this is not an intuitive matter, at least for Me. How do I remove the notes I’ve created and don’t need anymore? There are many ways to delete s Notes you created. After starting S Note app, tap the navigation menu (top left), switch to “All” view. Select (tap and hold) any S Notes. Once one or more S Notes are selected, the delete icon (dustbin) should appear. Tap the icon to delete the selected s Notes. You can also use My Files app to delete the corresponding spd file. The air command is already on and when i press the pen button while hovering my pen over the screen, the Air command features will not appear… Pls. help me .. Hover the pen over the screen (not touch the screen). Can you see the cursor (small circle)on screen? If you can see the small circle, press the button once. You should press and release the button, not hold the button. If you get used to it, it is very easy. You may try it a few times. I can’t get my air command on my Note 4 to launch after pen is out and air command closes the first time. Hovering doesn’t work. when you see the pen cursor on the screen (hovering the pen over the screen), press the button and release it. Action memo is not available in S View window for Galaxy Note 4. Yes, it is available in the S-View window in Note 3. I don’t know the reason behind this decision. Apparently Samsung is still experimenting features for S view cover. 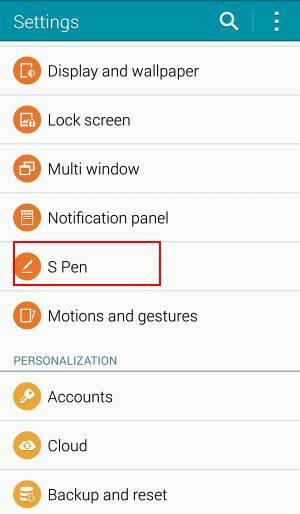 Settings- S Pen – detachment options. You should get 3 options: none, action memo, and air command (default). You cannot launch air command or you cannot use it? the method you mentioned is no longer working on Galaxy Note 4. If you use S Pen, you can use air command (screen write) to take screenshot as shown in the guide mentioned. Can you enable air command and magnification gestures at the same time on Note 4? No, air command and magnification gestures are still incompatible.